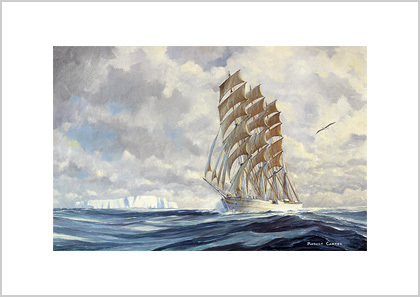 The 4-masted barque L’Avenir is being pushed along by a moderate north-west wind in the Southern Ocean, on her way towards Cape Horn. She was built by Rickmers AG to the order of the Belgian Maritime Association, as a cargo-carrying training ship. Her name can be interpreted as ‘the future, or what is to come’, representing the expectations of her owners, that she would produce a continuing supply of sail-trained seamen. Finnish shipowner, Gustaf Erikson, a Finnish shipowner, bought her in 1932 and put her into the grain trade with Australia. He retained her all white colour scheme which earned her the title, ‘Erikson’s yacht’. He utilised the extra accommodation that housed her cadets under her long poop, for passengers on the Australia run and for summer cruises around the Baltic. The pianist and composer, Percy Grainger made a voyage in her from Spencer Gulf to Falmouth in 1934. On 8 February 1938 she sailed from Port Germein with full cargo of bagged grain. Her last radio report on 12 April placed her well on the way to Cape Horn. Nothing was heard of her after this. The most likely reason was that she broached-to with a heavy following sea; an encounter with an iceberg was also possible. The only wreckage found was a lifeboat and a door, washed up on the Chilean island of Navarino near Cape Horn. 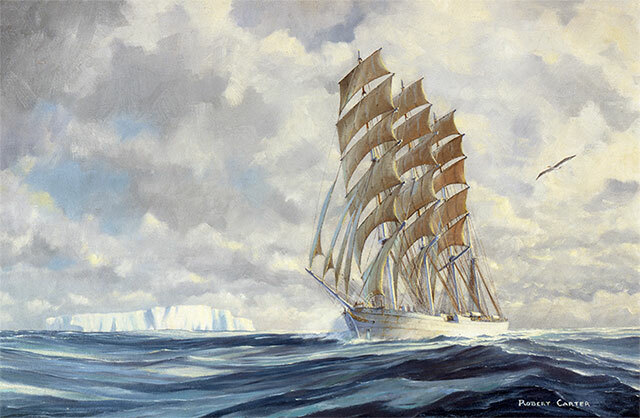 The 4-masted barque L’Avenir is being pushed along by a moderate north-west wind in the Southern Ocean, on her way towards Cape Horn. She was built by Rickmers AG to the order of the Belgian Maritime Association, as a cargo-carrying training ship. Her name can be interpreted as ‘the future, or what is to come’, representing the expectations of her owners, that she would produce a continuing supply of sail-trained seamen. Finnish shipowner, Gustaf Erikson, a Finnish shipowner, bought her in 1932 and put her into the grain trade with Australia. He retained her all white colour scheme which earned her the title, ‘Erikson’s yacht’. He utilised the extra accommodation that housed her cadets under her long poop, for passengers on the Australia run and for summer cruises around the Baltic. The pianist and composer, Percy Grainger made a voyage in her from Spencer Gulf to Falmouth in 1934.